Nirvighnam Kuru Me Deva Sarva-Kaaryessu Sarvadaa. With this lovely pray I wish you all Happy Ganesh Chaturthi. May lord Ganesh fulfill everyone's wishes & gives peace in the world. To people who are unaware about this festival , Ganesh Chaturthi is the Hindu( Indian ) festival celebrated in honor of the God Ganesh. Ganesh Chaturthi is celebrated with great joy and devotion in India & throughout world among Indians. People bring Ganesh Idols and worship them during Ganesh Chaturthi. Ganesh Chaturthi is considered as the day on which Lord Ganesh comes down on earth to give blessings to his devotees. This year I am going for eco friendly celebration as last year & thus decided to create Ganesh idol at home. I really enjoy making this & I hope if you will create it you will also enjoy it. Also I love cute Ganesh so I made this way. Some Clay pieces of different colors. I have used orange, red, blue, yellow, green, purple clay. Step 1. Take Orange & Blue color clay. Make balls out of them. You can create Blue ball little bigger than the Orange one. Step 2. Use blue ball & flatten it a little & give the shape of tummy. Step 3. Use Orange ball & give it a shape of face. Step 4. Take red clay. Make 4 small balls of the red color & give the shape of legs & arms. Attach is with the tummy you created before. Step 5. Use red clay again. Give it the shape of trunk for Ganesh. Attach it from the center of Ganesh's face. Note :- The trunk's end direction should be towards left of Ganesh. Step 6. Use green clay. Make ears from it & attach it with the face. Step 7. Use yellow color clay & roll it to make a small ladoo. Put it in between the trunk & hand. Refer the picture if any doubt. Step 8. For Crown take 3 different color clay yellow, purple & brown. Make 3 thin long strings with them. Roll yellow & purple in the spiral form separately & roll brown going back & forth. This should give the structures we need for the crown. Step 9. First place yellow & purple on the right & left side of head of Ganesh respectively. Put brown structure on top of both. Your crown is ready. Step 10. Use two black pearls & make eyes of Ganesh. Step 11. 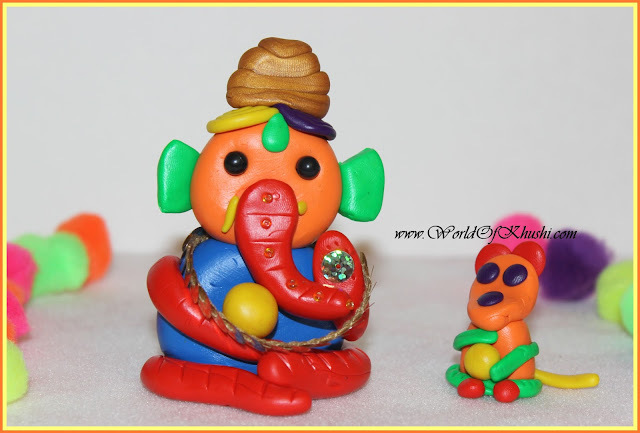 Take small yellow clay portion & make teeth of Ganesh. 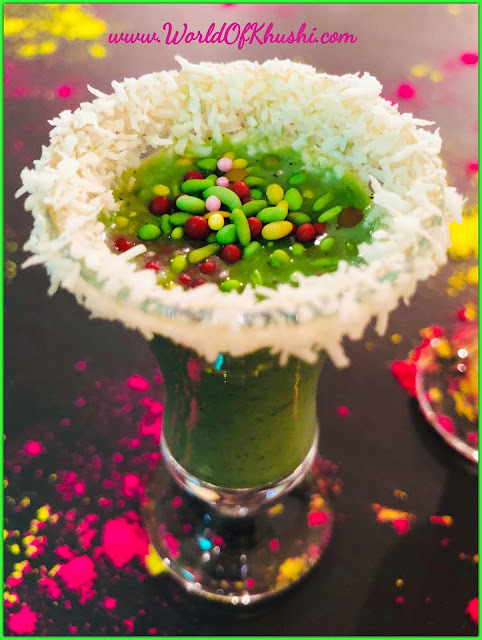 Similarly take green clay & make Ganesh Tilak. Step 12. Decorate Ganesh with some golden semi transparent beads( for trunk ) & golden garland. You can add a jewelry on his hand to show his blessings. 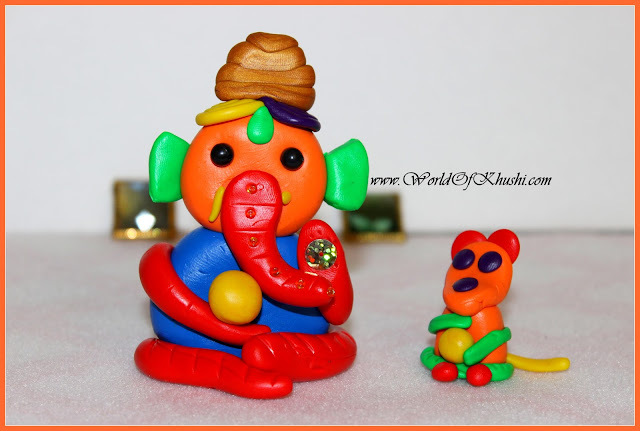 Follow the steps same as Ganesh, you can use different color clays & connect them to make the shape of mouse. Note :- Please refer the photo of Ganesh & his Mouse for better vision. I hope you like this post. You can put your imagination & creativity in your Ganesh. 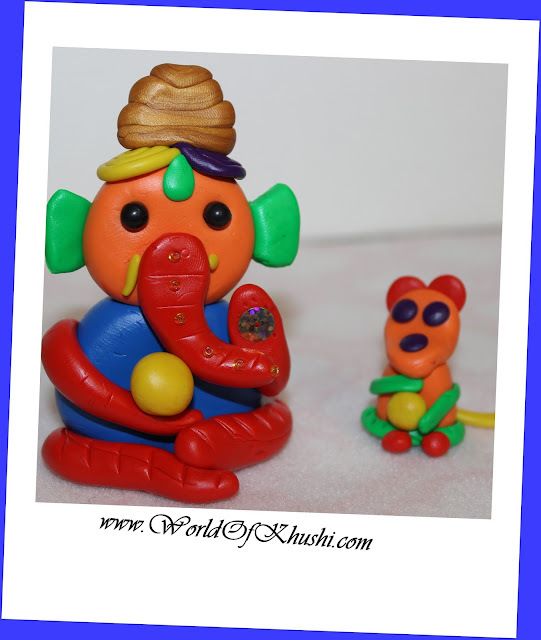 Do try this at home & share your creations with #KhushiWorld ( Instagram ), Facebook & Google+. Your comments & feedback is always valuable. Enjoy your day & celebrate the festival with lots of fun. I am also giving the link of last year Ganesh's if you want more for reference. Click on Last Year Ganesh.